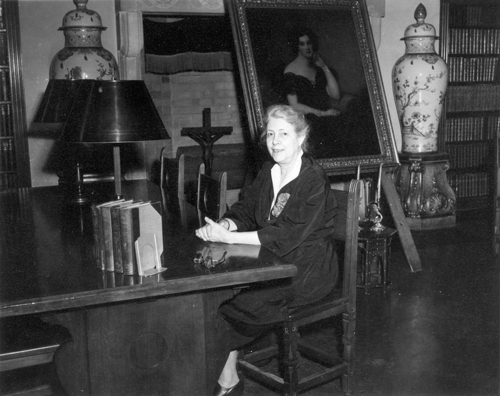 Dorothy Godfrey Wayman was a reference librarian for Friedsam Memorial Library from the summer of 1955 to 1962. Wayman had an interesting career prior to working as a librarian for the school. For over twenty years, Wayman was a journalist who served as an editorial staff writer and foreign correspondent for the Boston Globe. Not only was she a journalist but also she was the author of several books and articles for magazines such as The Saturday Evening Post and Atlantic Monthly. Wayman started her career as a journalist after the death of her husband in 1923. Wayman, along with her husband and children, lived in Japan for four years until an earthquake struck, killing her husband. While in Japan, Wayman learned to read and write Japanese, showing her talents as a quick learner and adaptability. The death of her husband was a critical point in her life. She was left penniless and in charge of three young boys. A friend’s encouragement to pursue a journalistic career helped her to make the choice to go in that direction. As a journalist, Wayman encountered many important people. She met famous politicians, world leaders, and so on. She also began writing books such as An Immigrant in Japan (1926), Edwards Sylvester Morse: A Biography (1942), and Bite the Bullet (1948). She received a gold medal from the French Institute of Letters for her book, An Immigrant in Japan. Bite the Bullet, a memoir, also received a lot of positive attention. These books were authored under a pseudonym, Theodate Geoffrey. This name could have been chosen for various reasons, probably to encourage a larger population to read her books. In 1954, Wayman received an honorary degree of Literature from Holy Cross College. Towards the end of her career at St. Bonaventure, Wayman suffered a health scare, contracting pneumonia, which sidelined her for almost a month. She recovered and was back to work for two more years. She retired in the summer of 1962, receiving a special dinner in her honor on August 13, 1962. Although she retired from St. Bonaventure, she in no way retired completely. She continued working as a journalist for the Olean Times Herald, often writing about the history of the Olean area and community. In 1964, She ran for the Olean Board of Education, using, “I am non-partisan—not ‘teamed’ with any other faction,” as her slogan. She won, but did not run for a second term. Wayman continued to write for the Olean Times Herald until her death on October 27, 1975 at the age of 82. She left behind an interesting and colorful life, one full of excitement and achievements. Throughout her life, she received multiple awards, honors, and recognition for her work as a journalist and author. She was a commencement speaker for St. Mary’s College, was awarded the gold medal by the French Institute of Letters for her book, An Immigrant in Japan, and received a special Papal Blessing from Pope John XXIII. Wayman’s life is a testament to hard work and tenacity. A female journalist, an unrealistic career path for many women at the time, she did not let this obstacle discourage her. She succeeded, becoming a prominent journalist and also part of the Saint Bonaventure community. 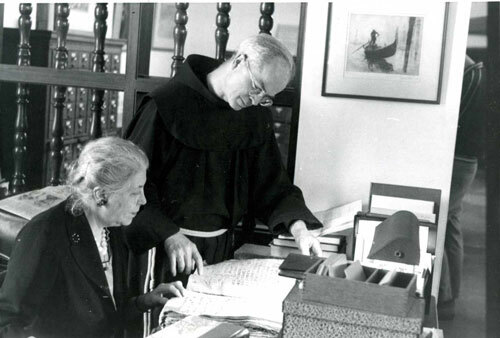 Dorothy Wayman and Fr. Irenaeus Herscher, O.F.M. “Cardinal’s Biographer Dies in N.Y.,” The Pilot, Nov. 7, 1975. Dorothy Wayman, “Commencement speech”, June 3, 1956. Rita Smith, “Sob Sister Recalls Heyday,” Buffalo Courier-Express, July 27, 1958. “Mrs. Dorothy G. Wayman to address club,” The Era, Nov. 6, 1958. Dorothy Wayman, letter to Rev. Irenaeus Herscher, O.F.M., March 27, 1955. Dorothy Wayman, letter to Rev. Irenaeus Herscher, O.F.M., March 21, 1956. Wayman, letter to Rev. Irenaeus Herscher, O.F.M. Political Advertisement, Olean Times Herald, May 1, 1964. This description was written by Bella Quijano as part of a history internship in the fall 2012 semester. Any changes, other than minor edits, are noted below.